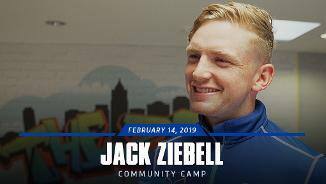 North Melbourne captain Jack Ziebell made a welcome return to full training on Monday afternoon. Jack Ziebell says he expects to play in North Melbourne's first JLT match next month. Ziebell was a crucial member of Murray Bushrangers’ premiership win in 2008. He averaged 18 disposals, 6 marks and 2 goals a game and was regarded as one of the best midfielders in his draft class. He also represented Vic Country in the 2008 Under 18 Championships, ranking in the top 10 overall for clearances, kicks and goal assists – all despite missing one match. The midfielder also became the youngest player to play senior football for Wodonga, making his debut when he was only 15. 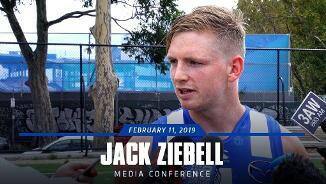 In his second season as captain, Jack Ziebell had a change of scenery with a move to the forward-line. Having spent most of his career as an inside midfielder, Ziebell quickly adapted to life as a forward, using his strength and attack on the ball to kick 35 goals across 22 games. Selflessly giving up time in the midfield to help develop some new faces, Ziebell led from the front each and every week, and set the perfect example for the young playing group. Alongside Ben Brown, Jarrad Waite and Mason Wood, the 27-year-old added a different dimension to North's attack, which was beneficial in games such as Round 17, when he bagged five majors against the Swans. 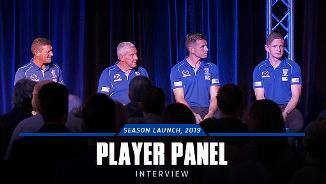 Ziebell’s first year as club captain mightn’t have gone exactly to plan from a team perspective, but there was still plenty to like about his 2017. 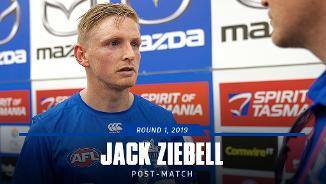 Often playing through injuries, Ziebell produced a number of courageous and commanding performances in the midfield, with a foray into the forward line against Collingwood in round 20 being rewarded with a damaging five-goal performance. “He had an excellent year, led from the front in our midfield, particularly early, he was terrific. “He had a really good pre-season, working on the parts of his game he needed to and he was able to take that into the season. “He had his best and most consistent year of footy so far. “There’s still scope to improve of course, and there’s areas of his game he wants to get better in. "Jack's been great. He's been really high on the defensive acts and the inside work. "His communication and organisation around the stoppages has been really good again. "Even in the last couple of weeks with the coach (Brad Scott) not around, he's really stepped up and shown really good leadership qualities." “His back half of the year was a lot more consistent, he started to influence games on a regular basis. “In a lot of the good wins we had, he was very important, which is what we want to see more often going forward. Primed for a big 2014, Ziebell was injured early in the Round 2 encounter against the Western Bulldogs. With his shoulder causing obvious discomfort, the midfielder still managed to finish the game but missed the following three weeks. 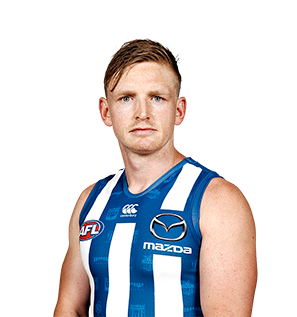 After returning to the side, Ziebell collected at least 23 disposals in four consecutive matches. However the injury bug would rear its ugly head again a few weeks later against Brisbane in Round 15. A knee problem ruled the number seven out for two matches and he returned as the substitute in Round 18 against Carlton. However it was shortly after the split round where Ziebell suddenly became an added threat down forward. While he had spent plenty of time in the forward 50 before, it started to pay off in Round 20 against the GWS Giants. 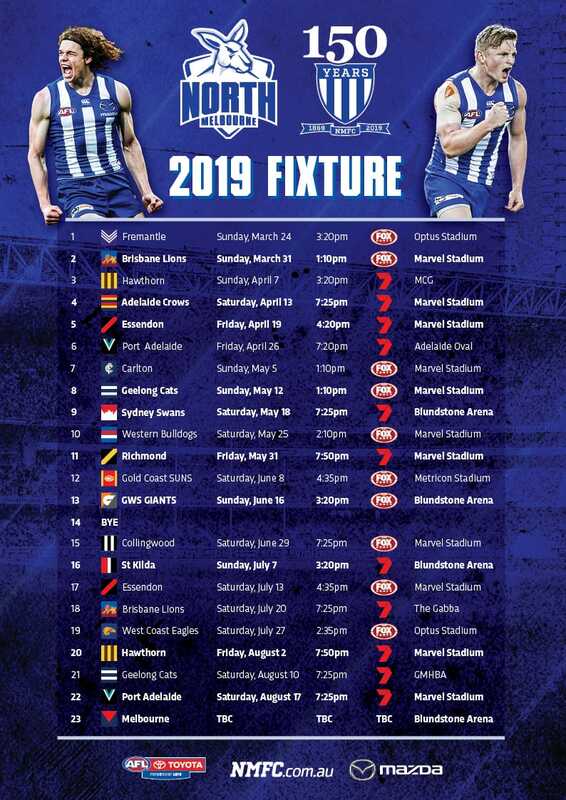 Two goals in a 75-point victory sparked something, and Ziebell ended up kicking 11 goals in his last seven games for the year. 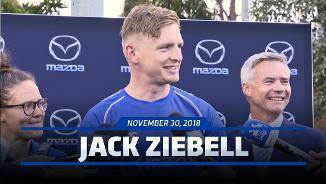 Ziebell then underwent post-season shoulder surgery and will return to the track just after Christmas. “Ziebs has been really solid and really consistent with the way he’s gone about his football so far this year. “He’s tough in the clinches. If there was an area to work on – he’s a technically good kick. But we’ve been working on getting the most value out of his possessions. The number 7's second half of 2013 endeared him to fans even more. His acts of courage and timely goals lifted North in numerous games. A 27-possession, 4 goal haul against Collingwood in the final round was the perfect end to a season of great improvement for the vice-captain. In his comeback game, Ziebell turned in arguably the best match of his career. 27 disposals and 4 goals led North past Geelong for the team's best win in a long while and gave the playing group self belief. Playing sore through the middle of the season, Ziebell was finding form when he was hit with a four match suspension against Carlton in Round 16. It caused uproar around football circles yet ultimately Ziebell spent part of the next month in Utah working on his fitness. The benefits of the trip were evident in the last few weeks of the season. 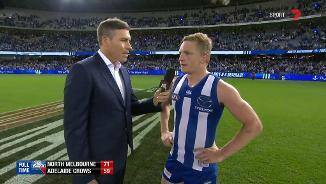 When others were wilting under a West Coast onslaught in the Elimination Final, Ziebell stood up with a quality 30-possession performance. Finally Ziebell was able to complete a season unimpeded by injury and it showed in the second half of the year. After criticism for a slow start, Ziebell worked his way into form and exploded for a remarkable 41-possession game in Round 17 against the Bulldogs - a career high. His first suspension of his career came in Round 23 against St Kilda after he collected Nick Riewoldt high with a bump. It meant his start to 2012 was delayed until Round 3. After his 2009 was ended prematurely with a broken leg against Adelaide, Ziebell took some time to find his feet again in his second season. His tackling pressure took a step up with five of his 14 games bettering anything he offered in his debut season. Just as he was starting to hit his straps, Ziebell suffered yet another broken leg against Geelong in Round 14, ending his second year in the same fashion as his first.